Who are you and what are you up to in the world? 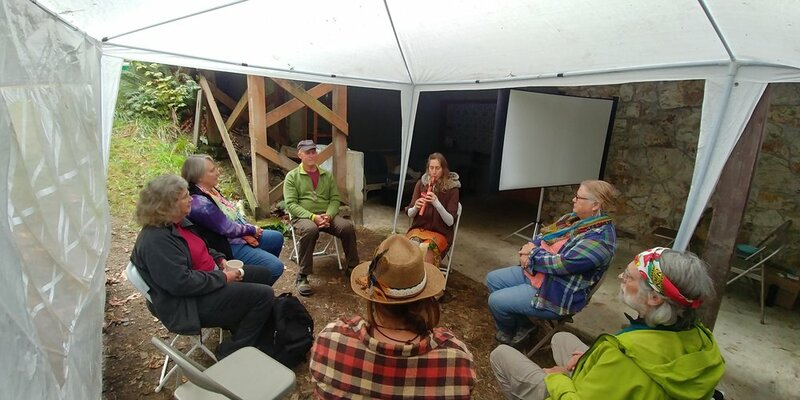 We are a cute unassuming couple that likes to study intentional communities, eco-villages and rewilding gatherings around the world in order to learn new ways of bringing flow state into the organizational structure of community living and daily life. Compassionate communication is an area we have invested in for the past decade and we are about to launch weekend couples retreats in Washington, Oregon, California, and Hawaii, exploring the relating skills we've been offering over the last decade in weekly hosted workshops. 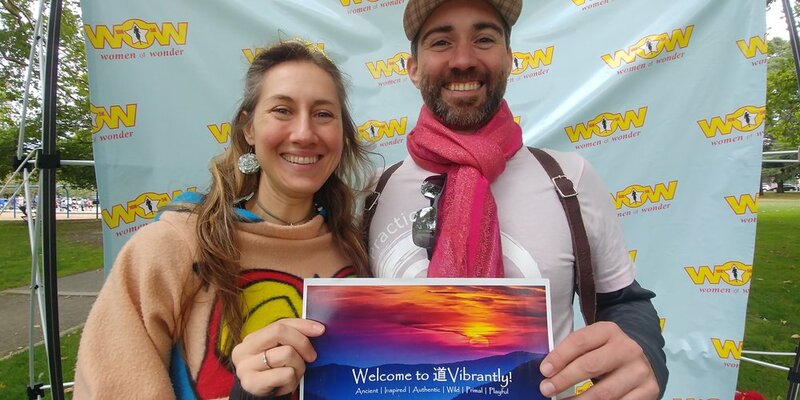 This past year, we have continued with our community building work around flow movement and communication while writing books and kicking off our new 200 Vibrantly Teacher Training program under the umbrella of our non-profit: The Way of Vibrantly. All in all, we're very thankful for all the friends and community we've made through Flow State Summit and we're really looking forward to bringing our latest findings to this year's Flow State Compassionate Communications workshop. ﻿In a recent workshop, we were kind of doing that thing where we were co-facilitating and we had separate approaches on many of the topics that were coming up, which almost seemed staged in how comical it all became. We seem to really excel in finding ways to add to the education in our workshops by being open and undefended in a humorous way about how often we disagree with each other. I think when people see how supportive we have learned to be in our disagreements, it's kinda of this "aha!" moment. We all went two hours without realizing it; the workshop felt like only 30 minutes. I think the good feelings from that workshop lasted for a couple weeks at an embodied level were you could still feel it, you know? Luke: I'm an interesting case because I actually learned to bring flow into my movement practice from being a rapper. Miku loves to rap too and we both kind of dance around when we rap. I was winning the best freestyler award consistently for several years at the Sunday Cypher Aware Show, I had more than 10,000 hours under my belt at freestyling, and I could get into the zone whenever I wanted to. When you're in the zone, as a rapper, there's these two feelings that are always there with you. It feels like the words are coming from a place that's both centered and exhilarated. I would find that space and store each rhythm and rhyming couplet into different muscles and movements in my body where I could feel that space open up. That's how I started getting into the flow state of nonverbal movement practice. Now I can feel a lot of healing and go into a trance just by letting my body move from a centered and exhilarated space. It became clear to me early that we can do a lot more with our mind when we integrate our body into the flow. Miku: I first experienced flow state with my piano improvisation. I have been playing piano since I was 9 years old and composing my own music. At a certain point, I began to experience moments of pure flow where my unconscious was bringing forth the music in a way I could never have anticipated. Experiencing flow state somatically through movement, mindfulness and breath-work and now through compassionate communication has been an incredible shift for me. It is all the same flow, all the same point of deep still-ness, instinctive knowingness and inspiration. Always moving, always shifting and yet ever the same energy underneath. Luke: Since I arrived at Flow State Movement from a place that was also verbal cognitive, with a lot of words and rhyming, I would often find myself in a teaching role for how to maintain that flow state during conversation with others. At a particular workplace where I was consulting, I remember in one of our monthly communication meetings, kind of introducing a lot of the tools Miku and I had been working with. You could feel the room move into this supportive space of centered and exhilarated flow state while each person spoke from an authentic flow state within themselves. A lot of these people hadn't necessarily experienced flow state before, and may not have much access to movement even in their life, yet they were able to instantly feel what that shared vibe feels like. The peak experience for me in that room was that there were two other rooms full of people that had dialed in on a conference bridge to participate and at one point someone was in tears over the speaker phone sitting on the middle of the table, sharing how happy she was to be able to connect from this space and connect with us in this way, in the middle of our workplace! That memory will never leave me and I can't help but smile really widely whenever I think about it. Miku: I think some of the most powerful flow state experiences I have had have taken place with other people. It is one thing to come into a state of flow within yourself, it is entirely different to do it as a group. All of the energy of the one becomes magnified with the whole. My deepest experiences with this have taken place during ceremony work with very very close peers. We move as one, we are one, and in connection with the One. The improvisation that occurs is like magic, and it is almost as if we enter into another plane of existing. A very very old one. It is as if the instincts of our ancestor awaken within us and we move in a deeply primal flow. Like the flowing of a river, the hyphae interconnectedness of the fungus and trees roots or the flocking of birds in the sky. We breathe, we flow, we move; in a beautifully and uniquely human way. The old way. Luke: My personal favorite life hack is the Layer Cake Tool, mostly because it can be used so often throughout a day to bring a sense of wonder and support to so many social encounters. You basically just notice when a topic in conversation is becoming stressful and you call out that there seems to be some layers to the cake. Just in that moment of taking a step back, there is such an empowering feeling to that. You can laugh about it which already feels like you're more resourced to take it on. Or you can write it down and come back to it later. I love pulling up online Trello lists of layer cakes that I have with friends. It's like a memento for how many times we've supported each other to excel in our flow states with each other and help each other not fall into fear state. It's also really fun to work through the layer cakes when you're feeling more resourced and notice how easy they suddenly are. Miku: My favorite life hack for having productive, fun and nourishing business meetings (no small feat!) is utilizing the canary fleet! Canaries are tiny roles anyone can take on during the meeting to help manage the meeting container better. There is a whole fleet of them from movement, to music, to play and even a slow canary. In fact, Slow Canary was our first Canary. To take on the slow canary role, one simply sets a phone timer for 15 minute intervals during the meeting. When the timer chimes, everyone stops what they are doing and takes 2 slow long breaths to reconnect and check in. This way we keep our grounded-ness even as we are brainstorming and flowing together as a team during our meetings. Slow Canary supports personal flow and group flow simultaneously and it is as easy as setting a chime on your phone! Here is a link to our Blog article on it if you want to read more and try it with your organization. Luke: You know for me, especially when it comes to freestyle rap, I can start getting into fear state if I make a mistake and I'm on stage in front of a big audience. When that happens, my muscles start to constrict which increases the cortisol and adds to the fear state. If I could dance on stage I would but in this case I need to use my words while being in flow state. If I try to relax, it can feel vulnerable which can feel dis-empowering if I'm not cognitively present and feeling my power. The first thing I do before relaxing is I take a second to discern if my environment is supportive. If I'm in a room where people want me to feel my zone, my centered and exhilarated space in my body, then I know it's just me. Do I want that too? Do I want it as much as they want it? Yes! At that moment, I can start relaxing and the fear state leaves me. Miku: I used to experience fear state when I was giving conference presentations or public lectures at university. I would notice my hands growing cold, my palms getting sweaty, and my heart beginning to beat rapidly. Eventually, I learned some important lessons for how to manage this. First, no caffeine before a big talk or performance. It makes you sweat and also might make you feel you have to pee! That is totally the worst thing when you are trying to focus on serving others. Second, eat a banana. Sometimes we move too fast and forget to nourish, a banana is a quick grounding food that instantly gets me ready for a big presentation. Third, practice at least 8 times! There is no way you can be overwhelming nervous or fail if you do this because your talk or performance will be in your muscle memory. Once it is in that deep you will be in a much better place to access flow while performing. In my experience practicing the full set (with the timing and final touches) eight times can actually take a lot of time and be a little difficult to do, but if you make it the full 8 times, you will do an amazing job almost guaranteed. Lastly, practice coming into a flow state when you are not performing. In your down time, find a way to access and reach your center. Find a way to consciously calm your nervous system and slow your heartbeat. If you can do this consciously, odds are high in those moments between your words, your moves, your share...you will be able to slow yourself down and feel centered when it comes time for the big show; and that is where the magic happens! Luke: Outside of my career, I'm most passionate about being a father soon. Miku and I have been together for 15 years now and we're trying for children now and keeping our fingers crossed that we can be successful. That baby is going to be a flow state genius, haha! Miku: Awwww! Who could top that? Hmmmm. Whether it is my career, or outside of my career, I am most passionate about my gift to give the world. My personal dharma is to help bring vibrancy to the world! Whether it is through The Way of Vibrantly, or singing songs when I walk down the street. I am so grateful to be on this path, realizing my gifts with my amazing partner, Luke and my incredible team. We can’t wait for Luke and Miku to teach at the Flow State Summit! Want to find out more about Luke and Miku?